The BPS workshop on transitions in psychology was an excellent opportunity to meet with psychology academics and teachers and discuss how we can make a smoother transition from school to university and to the world of employment. Here I have included some of the interesting points that were raised during Julie Hulme’s and Peter Reddy’s presentations, as well as from the discussion with other attendees. Transitions can be exciting but also very challenging. Students face substantial difficulties at the beginning of their degree and there is often a gap between students’ expectations and reality. For example, students are told that they will need to become independent learners at university, but they often don’t have a good understanding of what that means. Some of them appear to expect that the lecturer will tell them which book chapters to read, and they will go away and read it and all will be fine. They soon realize that there is not as much hand-holding as there is at school, nor a predefined narrow curriculum. Another typical example of the gap between expectations and reality is the amount of statistics and research methods that psychology students have to go through. And of course there are many differences in terms of teaching and assessment between the two types of education. For example, A-level students are not required to write essays, which explains why students tend to struggle with essay writing when they first arrive to university. It appears that nothing can fully prepare the prospective students for university study. Not surprisingly, the first year is the most precarious for dropping out of the degree. Apparently around 8% of first students drop out and around 40% have considered it. Ethnic minorities and mature students are higher at risk. So how can we make the transition from school to university smoother and reduce the high drop-out rate for the first-year students? Social networks are crucial. Support from family and friends is a strong protective factor. It is also very important that students establish a new supportive network of friends at university. Students should ideally feel part of the community of psychology that includes lecturers, students, receptionists, technicians,everybody involved in running the department. To promote a sense of community, departments tend to organize social events out of the curriculum. Although these can be successful and effective, there are not always inclusive. For example, evening events that include alcohol might not be well-attended by mature students with families and/or those not drinking alcohol due to religious reasons. Apart from face-to-face events, Facebook groups for first years students to join can be created, where students can exchange ideas about their subject matter and feel part of the psychology community. Vertical tutoring can also provide support; advanced students mentoring less advanced students can prepare them for what lies ahead and give them valuable insights into university study. This is something that is about to start here at psychology at Oxford Brookes. Communication between teachers and lecturers is paramount. This can be done through BPS meetings – such as this one! They could also collaborate to create more effective events that might help the transition from school to university, such as induction for first year students. At the moment the induction typically lasts a week, and students are mainly asked to attend a variety of talks given by university staff. Perhaps a longer, more inclusive and active induction can be arranged during the summer before the first years start university, in which prospective students get involved in projects. Furthermore, lecturers and teachers could collaborate to deliver lectures at the schools. Another idea is peer observation between lecturers and teachers, so that they have first-hand experience of what each other’s job entails. One of the important differences between teachers and lecturers is that teachers have a prescribed curriculum while lecturers can create their own materials and assessment. As a result, different psychology departments have a different focus and specialization. It is important that teachers are aware of that so that they direct their pupils to the psychology course that is right for them. University websites could become more accessible to help teachers and pupils in that respect. Other ideas suggested were that university students could become mentors in schools and pupils could help with university research as research assistants. Julie Hulme also noted that teaching could be more inclusive for first year students. Their prior learning and experience is not always acknowledged; academics often feel that students should ‘unlearn’ what they learned at school. However, building on what students have already learned could be more helpful for the students. Furthermore, assessment of the students’ knowledge before the degree starts and giving support to those prospective students that have considerable gaps in their knowledge could make the transition to university much smoother and give all students a good baseline before they start their university degree. Finally, Julie noted that the whole degree is in fact a time of transition, and students can find the transition from one academic year to the next very challenging. Hopefully they can draw from their experience of transitioning from school to university, to help them deal with future transitions. Change is difficult, but it is a fact of life and we must all somehow learn to deal with it. In the happy event that students have completed their degree, a further question arises: how well-prepared are they for the world of employment? Unfortunately, Peter Reddy noted, we can’t fully prepare them for what lies ahead. And, anyway, is this what the university should be about? Should it be about just providing technical skills to help you do a certain job, or should the main focus on cultivating understanding of a certain area of knowledge? Even if some of us, including Newman (1958), agree with the second option, the issue of a smoother transition from university to employment still remains. Here are some practical suggestions: Some institutions such as Aston University in Birmingham organize regular alumni events, in which current students can discuss with alumni about possibilities of employment after the degree. VESPR organized such an event, and it was intriguing to see what the Oxford Brookes alumni have been up to. Some departments also ask students in their first year to write an essay about their strengths and weaknesses and reflect on whether certain careers would be suitable for them. Such an activity early on can make student aware of what might be the best option for them. A lot of psychology students want to become clinical psychologists, but is this the right thing for them? Does it suit their character, their skills, their talents? Furthermore, some universities organize career boot camps, where they offer graduates that have not landed on a job some brief training to help boost their chances to get a job. Other universities offer work placements to undergraduate students as part of their degree. Placements are important as the student learns to be part of a professional community and can start reflecting on how to be a professional and how to present themselves professionally. Students that are studying for a degree that doesn’t include placements could potentially take up voluntary placements by contacting local organizations and charities. It is interesting to note that many students opt to do a Master’s after they finish their undergraduate degree. At this point careful consideration is needed as to what they aim to achieve with it. Is it to go on to a PhD, is it studying for its own sake, or would it lead to a certain job? Peter also mentioned vocational programs in Sweden that appear to ease transition to employment. The list goes on. With our VESPR project we hope to help with transitions within the undergraduate degree, as well as with the transition from university to employment. Our recent alumni event was very well received and hopefully gave some inspiration to the current students about what they want to do next. We were certainly inspired by the amazing talks by the alumni! We hope VESPR will enhance the sense of belonging to the psychology community for the students, even after they have flown the university nest and embarked in their professional adventure. Last night we held the first VESPR Alumni Networking Event. We’ll post some photos and a lecture capture of the event shortly. In the meantime, a summary and some tweets from the Alumni Networking Event can be seen on Storify. The Mozilla Open Badge system is a standard for recognising and verifying activities and skills that are not covered by formal qualifications. 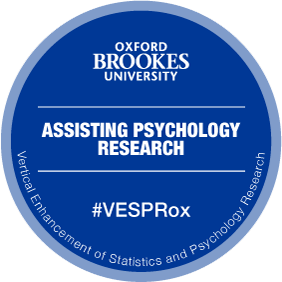 In VESPR, we are using them to encourage engagement with our project in the form of co-curricula and extra-curricula activities which support the project’s aims of enhancing statistics and student research as well and improving links with our own alumni. 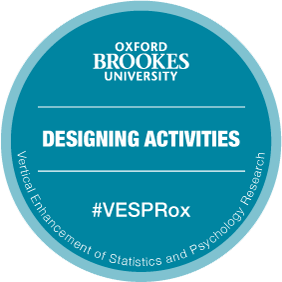 VESPR now offers twelve badges which (using colour coding) are aligned with the five Brookes graduate attributes. Disciplinary and professional knowledge and skills, understanding the epistemology and ‘landscape’ of the discipline, and what it means to think and behave as a member of that disciplinary and/or professional community of practice. Create a poster based on research performed as an Undergraduate or Masters student at Oxford Brookes University. Present the poster to an academic audience external to the Department of Psychology, Social Work and Public Health. Submit a satisfactory 500 word report on the experience to VESPR which reflects on the design of the poster and the experience of presenting it. Publish a paper based on research performed as an Undergraduate or Masters student at Oxford Brookes University. Submit a satisfactory 500 word report on the experience to VESPR which reflects on the the experience of writing for publication and engaging with the review process. Speak as an alumnus at a VESPR networking event about your personal journey from studying psychology at Oxford Brookes to your current career. Submit a satisfactory 250 word report on this journey which can be used as an abstract for the presentation. Ability to be a critical consumer of research, and also, where possible, to design and undertake at least a small-scale research project in the discipline, using appropriate methodology. Participate in at least four experiments advertised in the VESPR participant panel. The experiments must be on different topics and be from U24137 – Advanced Statistics and Experimental Method for Psychology. You should not be currently studying this module. Submit a satisfactory 250 word report on the experience to VESPR which reflects on the experience and the good and bad points of the experimental designs. Complete at least four questionnaires advertised in the VESPR participant panel. The questionnaires must be from U24120 – Questionnaire Design for Psychology. Submit a satisfactory 250 word report on the experience to VESPR which reflects on the experience and the good and bad points of the questionnaires. Participate in least four undergraduate or Masters dissertation studies advertised in the VESPR participant panel. The studies must be on different topics and include at least one questionnaire and one experiment. 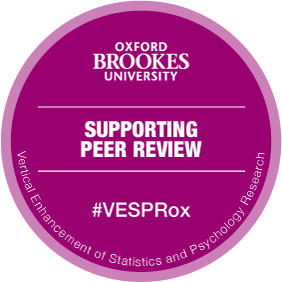 Submit a satisfactory 500 word report on the experience to VESPR which reflects on the experience and the good and bad points of the studies and compares the two methods. Act as a research assistant for a staff member from the department of Psychology, Social Work and Public Health. Have direct involvement with at least two steps of the research process, e.g. literature review, experimental design, creation of experimental material, data collection, transcription, data analysis. 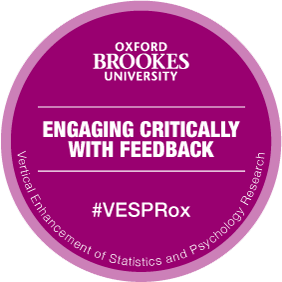 Submit a satisfactory 500 word report on the experience to VESPR which reflects on the experience and the study supported. Understanding how one learns, the ability to assess the work of oneself and others, and to identify one’s strengths and weaknesses. The ability to organise oneself and perform as an autonomous, effective and independent learner. The ability to relate to other people and function collaboratively in diverse groups, including the development of appropriate interpersonal skills, emotional intelligence and adaptive expertise. Submit two satisfactory 250 word reports reflecting on feedback received before and after submitting a lab report or dissertation. The first report must include at least three action points to be taken forward to the next piece of coursework. The second report must include a reflection on how successfully those action points were addressed, in addition to three further action points for the next piece of coursework. Support the demonstrators for at least one peer review session in a module that you have previously studied. Submit a satisfactory 250 word report to VESPR reflecting on the experience, including how it might improve your own future work. The functional access, skills and practices necessary to become a confident, agile adopter of a range of technologies for personal, academic and professional use. To be able to use appropriate technology to search for high-quality information; critically to evaluate and engage with the information obtained; reflect on and record learning, and professional and personal development; and engage productively in relevant online communities. Make at least four edits to VESPR resource Wikis adding and/or reviewing links to online resources or books. Design and/or create an activity for VESPR in collaboration with the demonstrators. Such projects may also be endorsed via the InStePP ePioneers project. Knowledge and skills, showing cross-cultural awareness, and valuing human diversity. The ability to work effectively, and responsibly, in a global context. Knowledge of global perspectives on how disciplinary knowledge is represented and understood within other cultures; cross-cultural capability beginning with an awareness of our own culture and perspectives and the development of the confidence to question one’s own values and those of others responsibly and ethically; and responsible citizenship, actively engaging with issues of equity and social justice, sustainability and the reduction of prejudice, stereotyping and discrimination. 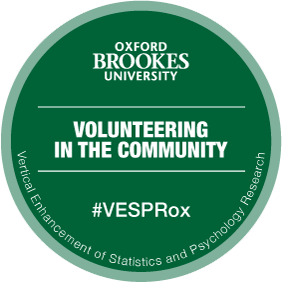 Volunteer for at least 4 hours for an organisation external to Oxford Brookes University. Add/edit details of the opportunity to VESPR if the organisation is interested in future volunteers. Submit a satisfactory 250 word report to VESPR reflecting on the experience, including how it relates to the global citizenship criteria. Professor Vince Connelly cuts the ribbon! Our launch party on Friday 19th September was an opportunity for students to find out about our plans for the project. Wakefield gave a brief presentation about our plans for the next two years. This was followed by an official ribbon cutting ceremony to mark the start of the hard work. Students and staff then joined us for some fantastic cake and chatted to team members. We are now working on building the initial resources that will form the basis of our virtual learning space. We are talking to students to find out what they would find helpful under our six main topic areas; review, ethics, research, analysis, writing, and dissemination. 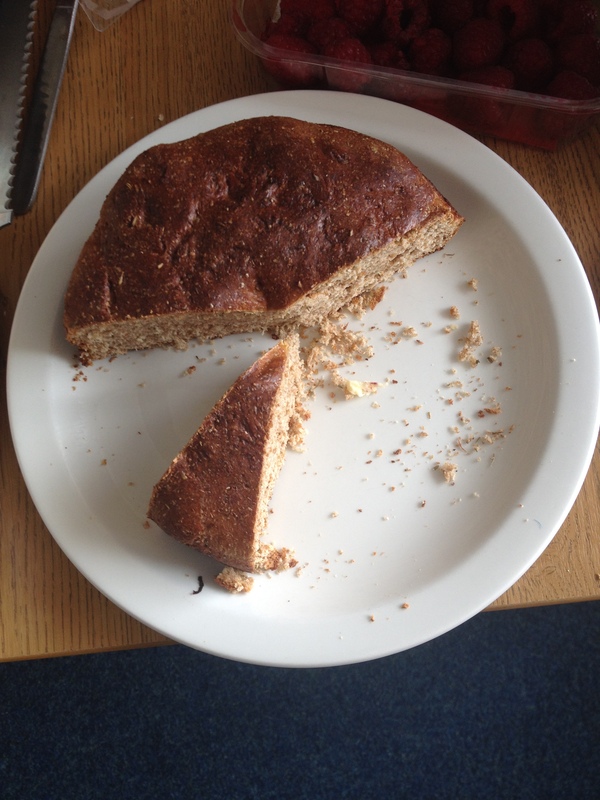 Join us for tea and homemade cake to mark the official launch of our project. The VESPR team will use this blog to provide updates throughout the project. We are interested in hearing the views and experiences of anyone with an interest in teaching and learning statistics within psychology in higher education. This includes university students, lecturers, demonstrators, technicians, A-level students and A-Level teachers. The owl on the scooter is called Athena and was named after the Greek Goddess of Wisdom. Florence Nightingale also had a pet owl called Athena. Nightingale was responsible for great advances in medical care through data collection and analysis in hospitals. The artwork itself is by Nigel Dobbyn.